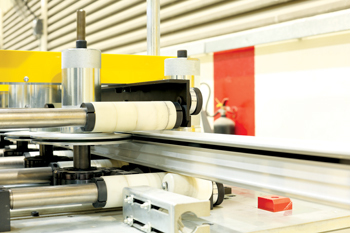 Bahrain Aluminium Extrusion Company (Balexco) is preparing to pursue a new roadmap of growth with an objective to restore the leading extrusion company to its glorious days and achieve new levels of success. Led by the company’s newly appointed general manager Robert Holtkamp, the Bahrain-based company, which is in the midst of a major restructuring plan, has chalked out a new strategy which addresses the short term challenges as well as focuses on the company’s long-term, sustainable success. “The objective is to restore Balexco in all its glory and return it to its rightful place as an industry leader in the region,” said Holtkamp who is leading the company through a tough period. In his first interview since taking over in May this year, Holtkamp revealed to Gulf Industry his turnaround plan for the company, which he labels as a `sleeping giant’. “In the last decade or so, Balexco has not spent enough time on its branding and marketing, which I think, is very important for companies to be recognised as industry leaders. “For a long time, we have been concentrating on very few markets only. But now we would like to spread our wings in different territories and would like to bring a bit of aggression in our approach,” Holtkamp said. The other prongs of a massive growth strategy mapped out by the new GM include: increasing Balexco’s powder coating capacity; commissioning new machinery, diversifying its products portfolio and expanding its sales channels. “It’s our target to set Balexco back on the map again in the next 1-1/2 to 2 years. I am confident that Balexco will be a growing entity in the GCC market. We have to spend more time in branding and marketing and increase our presence in the market,” said Holtkamp. Balexco was the first aluminum extrusion plant in the GCC when it was set-up in 1977. Taking the lead in the region, it built an integrated plant -- spread across 62,000 sq m at Sitra Industrial Area -- that positioned its manufacturing capacity as one of the most technically advanced integrated plants. Since its inception, the company has increased its production capacity to 33,000 tonnes per year (tpa), coming a long way from its initial humble 6,000 tonnes capacity. Today, it has four state-of-the-art extrusion presses, two of those are from SMS Schloemann, Germany and one each from Glecim, France and GIA Spain. The company’s extrusion presses are complemented by a fully automated anodising and horizontal powder coating line with a capacity of 4,500 tonnes per annum from SAT SpA Italy. These in-house surface treatment plants are in compliance with Qualicoat for powder coating and Qualando for anodising plant. To reinforce its market position, Balexco is now going for a major push towards powder coating by increasing its powder coating capacity. It has just commissioned a new vertical powder coating plant which was in the installation phase since last year. Procured from SAT SpA Italy, it is a major plant enhancement investment made by the company in 2017. “By commissioning the vertical powder coating line, which runs double speed, we have submitted to our customer demands,” said Holtkamp. 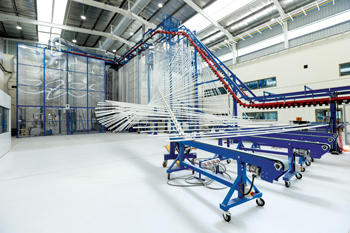 Balexco’s new vertical powder coating line is the first of its kind in the Middle East with Visual Recognition System (VRS) technology and will double the company’s powder coating capacity to 16,000 tpa. This line also offers key advantages including higher productivity, lower operating costs and optimum design for a long series of similar profiles. “The new vertical powder coating line brings us at par with all the competitors in the region in terms of enhanced quality product,” he said. Further, the latest VRS technology will help in having consistency in powder quality over a period of time as the profiles are automatically detected and the powder coating consistency is automatically loaded, he added. Additionally, the firm has just started its first ever thermal break line which will give it an opportunity to tap the expansive projects market and give added value to its customers. As the function of these thermally broken profiles is to reduce the energy, they would lessen the carbon footprint and promote the Green Building concept, thus consolidating Balexco’s position in the fast emerging new market. According to Holtkamp, the company has no plans to run full capacity at the moment as currently the supply is much higher than the demand. “We are working in three shifts in full capacity. We could always do more but the question is whether we want to do full capacity as it all has to do with the price levels of the existing market,” he said. For now, Balexco has a good pipeline of orders and support of its Board of Directors including the GFH, which is the major shareholder in the company, Holtkamp assured. However, the volatility of the oil and metals market continues to be a serious issue, impacting the company’s overall performance. Though the company achieved modest growth in output and revenues in 2017 after seeing a challenging 2016, it’s upbeat and bullish on future growth. “The aim is to grow in profitability. 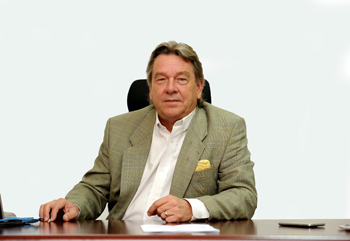 I am looking at between now and 12 to 18 months – we will be an established profitable company not only in the GCC but also outside the GCC,” Holtkamp said. To achieve the goal, Balexco plans to make it possible by approaching new customers, targeting new markets and diversifying its product mix from its traditional door, window commercial profiles to industrial profiles. “We have to diversify in our markets and our products and this is what we are doing actually,” Holtkamp reiterated. 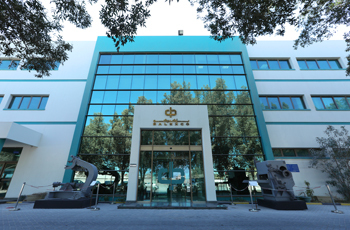 A volume-based business, commercial profiles at present constitute major part of Balexco’s total sales. According to Holtkamp, these have wide acceptance in the market as they are mostly architectural door, window profiles and can be custom made too. However, Balexco believes that diversification from architectural profiles to new applications will further provide the impetus to the growth of the extrusion industry. Towards this, the company has just introduced a new product line aimed at new sectors. Further, the company also plans to push its Balexco System profiles which were designed and tested in Europe and are well accepted in the GCC market. As a system supplier, Balexco has good position in the GCC construction industry. Also, for its Kitchen profiles, Balexco said it is continuously upgrading its product portfolio by adding new sections as per the market demand in order to sustain itself in the highly competitive, price conscious and evolving market. The company boasts of having a wide variety of profiles duly tested for their performance and available in many options. “Also our system profiles are easy to fabricate and install and is a value-for-money proposition,” Holtkamp said. To spearhead its growth plan, Balexco is planning to put a bigger thrust on exports by targeting new markets like Eastern Europe and West Africa. The company, which exported around 70 per cent of its output to markets within the region, while consuming the remaining 30 per cent locally, now plans to change the ratio to 60:40. Since the beginning, Balexco has been an export oriented unit (EOU) and exported nearly 70 per cent of its production within the GCC market. Saudi Aribia accounts for 50 per cent of the sales volumes followed by Bahrain with 30 per cent and 20 per cent from the rest of the GCC. Balexco has well-established branch offices in Saudi Arabia and the UAE. The company enjoys a dominant position in its home market of Bahrain and has achieved incredible success by cornering more than 70 per cent market share each year. This has been made possible by having close mutual relationship with the big three aluminium traders and the key players in the fabrication industry. “The Bahraini construction market is growing but has limited demand so we have to make exports bigger part of our production,” Holtkamp said. Balexco, he added, will focus on expanding its sales base in the Mena region as well as look at countries in Europe, Eastern Europe and West Africa. “We will have to look at other GCC countries like Oman, the UAE, and others in the region,” he added. Meanwhile, the company which is a specified supplier in the Ministry of Housing (MOH) and Ministry of Works (MOW) projects and other Private Public Participation (PPP) projects in Bahrain plans to put extra thrust on tapping the projects market in the kingdom and the GCC. “We are looking at getting aggressively into more projects and therefore we have started to contact foreign system suppliers,” revealed Holtkamp. Some of the key projects executed by Balexco using system profiles are: Riyadh Metro and Ice Mall, Riyadh, Radisson Blue Hotel, Makkah and King Abdul Aziz Culture Center, Dhahran in Saudi Arabia; East Hidd Housing Project, Villa Compound Project, Amwaj Island and all MOH projects in Bahrain; Fox Hill Residency Project and 92 villas in Qatar; a high rise 28 storey tower in Kuwait and several other housing projects of MOH, MOW. Commenting on the market scenario, Holtkamp said that market has been tough since the downfall of oil price, with demand being low and production capacity high. “The Middle East produces 10 per cent of the world aluminium production. I estimate that these markets will recover provided the government finds out outlets to base on their market on. I think what will definitely help Bahrain is the recent oil find. It will give tremendous boost to the economy,” he added. The industry veteran also called for greater support to the local downstream companies from aluminium major Aluminium Bahrain (Alba). Alba›s Line 6 expansion, it may be recalled, is expected to add another 514,000 metric tonnes, bringing production capacity to around 1.45 million metric tonnes, creating opportunities in downstream aluminium manufacturing. Holtkamp also believes that industry support and commitment is vital in embracing the use of recyclable aluminium in its industry. Even though the Middle East produces 10 per cent of the world aluminium production, the region is not yet mature in terms of recycling the metal: the rate of recycled aluminium in the Gulf is believed to be around 10 per cent. Balexco, however, is already at the forefront of this initiative as it recycles its own aluminium. “Yes, we do recycle our aluminium. You can recycle aluminium endlessly, it does not lose its characteristics,” Holtkamp explained. “We are looking at developing green billets which are made of recycled aluminium and are sold to reduce the carbon footprint. But to be more competitive in manufacturing these we also need the participation and the commitment of all the smelters like Alba; EGA to help us in the logistics track,” he added. Meanwhile in order to maintain process efficiencies, the company has set up a cost reduction committee which brainstorms every week for cost saving initiatives to streamline the company’s overall value chain without affecting the manpower strength. It also looks into better utilisation of energy, oil, gas, water and electricity in the company. “We are organising and reorganising the company by giving people different tasks and creating more job value for them,” he concluded.